The measure would eliminate nonmedical exemptions to vaccinations for measles and other infectious diseases that are required before children enter school. 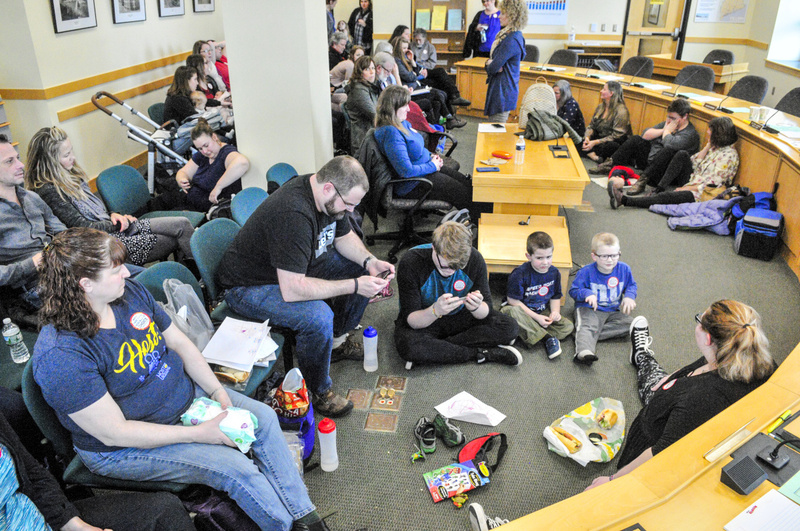 AUGUSTA — Hundreds of people descended on the state capital Wednesday to testify on a bill that would eliminate nonmedical exemptions that allow parents to opt out of having their children vaccinated against measles and other infectious diseases before entering school. 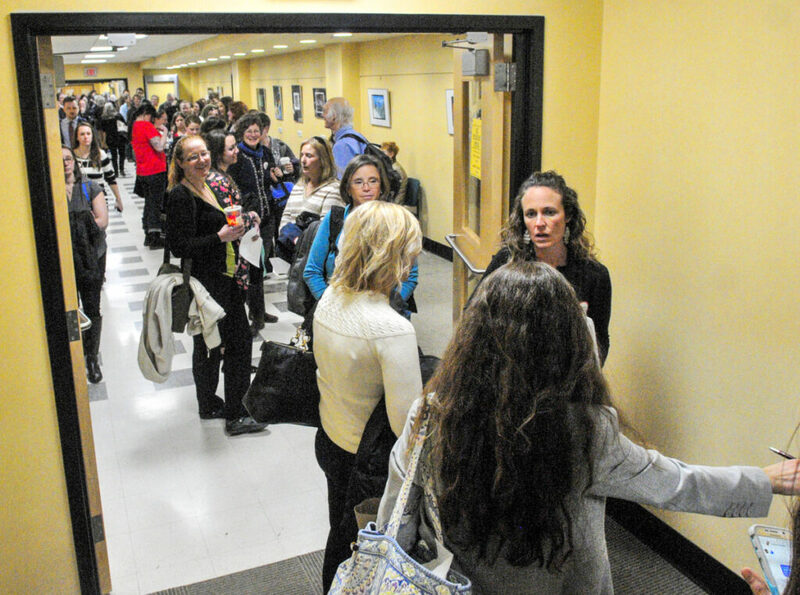 Hours before the public hearing was to begin, a line snaked out the door of the committee room and down the corridor of the building where the Legislature’s Education and Cultural Affairs Committee meets. In the coming weeks, the bill will be discussed in committee and voted on in the Legislature. 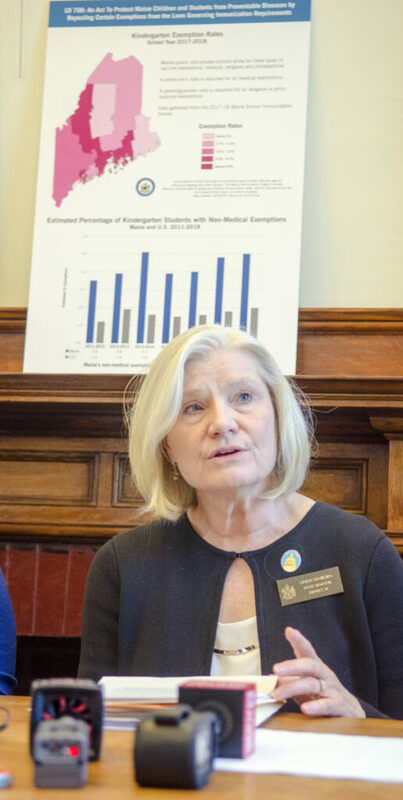 Sponsored by Rep. Ryan Tipping, D-Orono, and Sen. Linda Sanborn, D-Gorham, the bill would remove philosophic and religious exemptions in an attempt to improve vaccination rates and make Maine less susceptible to the return of preventable infectious diseases such as measles, whooping cough and chickenpox. Maine has the worst rate of pertussis – also known as whooping cough – in the nation, with 90 cases through the first two months of this year and 446 cases in 2018. Dr. Sidney Sewall, representing the Maine chapter of the American Academy of Pediatricians, said that vaccines and clean water are two of the most effective public health advances of the last 150 years. The bill, if it were to become law, would not force parents to immunize their children, but would require that students get immunizatons prior to attending school or prove that they can’t receive vaccines because they have a legitimate medical reason, such as having leukemia. Parents who decide against vaccinations would have the option of homeschooling or having their children take online courses. Wednesday’s hearing highlighted the tension between the individual autonomy sought by parents and the dangers that infectious diseases pose to children who are too ill to be vaccinated, as well as the health of the community at large, which benefits from the “herd immunity” provided by widespread vaccination. Dr. John Bancroft, chair of pediatrics at Maine Medical Center and Barbara Bush Children’s Hospital, said having too many unvaccinated children becoming vectors for disease can have “devastating” effects. But Rep. Jeff Hanley, R-Pittston, said that Tipping’s bill would infringe upon parental rights to not vaccinate their children. Maine has one of the highest school opt-out rates in the nation, in which parents check a box claiming a philosophic or religious objection to vaccines when they enroll their children in school. Maine would join California, West Virginia and Mississippi as the only states to completely eliminate nonmedical exemptions. California eliminated the exemptions two years ago after a measles outbreak. This year, Washington state and New York City are experiencing measles outbreaks caused by unvaccinated people spreading the infectious disease, with more than 70 falling ill to the measles in Washington and 133 so far in New York City. Some of Maine’s schools have reported dangerously low vaccination rates. For some infectious diseases, herd immunity can be weakened if fewer than 95 percent of the students are vaccinated. Herd immunity refers to protection from infectious disease that occurs when much of a population is immune because they received vaccinations. The Maine Center for Disease Control and Prevention reported that 31 public elementary schools were reporting 15 percent or higher rates of unvaccinated kindergarten students in the 2017-18 school year, the latest year for which statistics were available. In 2017-18, 5 percent of Maine children entering kindergarten – about 600 children statewide – had nonmedical exemptions for immunizations, with their parents opting out on philosophic or religious grounds. 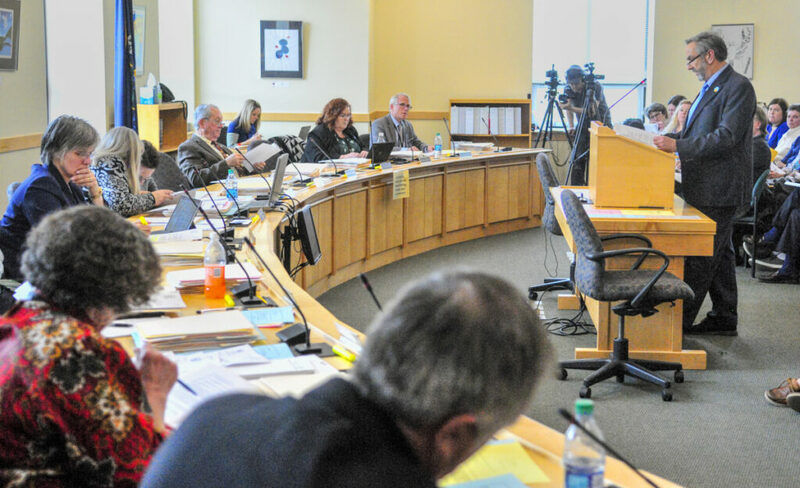 The Maine CDC, the Maine Department of Education, and other groups representing school nurses and the medical community testified in favor of Tipping’s bill, which also applies to day cares. 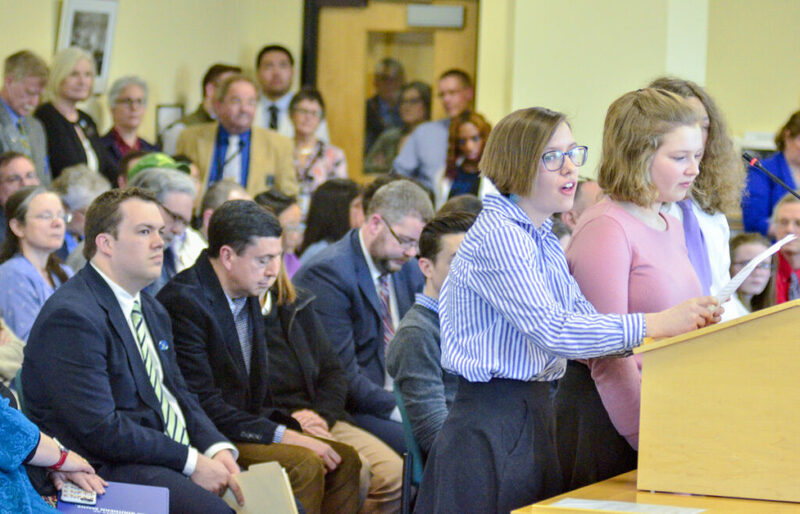 “The Maine CDC supports (the bill) because it will keep our children healthy and safe from unnecessary disease, ensure safe schools and child care centers, and protect vulnerable people against serious diseases,” said Nancy Beardsley, acting Maine CDC director. Susan Meehan of Augusta said her daughter, Cyndimae, suffered from epileptic seizures 27 hours after receiving a series of vaccines, including against diphtheria, tetanus and pertussis, in 2003. Cyndimae had epilepsy her entire life, and died on March 13, 2016, exactly three years ago from the hearing, from Sudden Unexplained Death in Epilepsy, Meehan said. 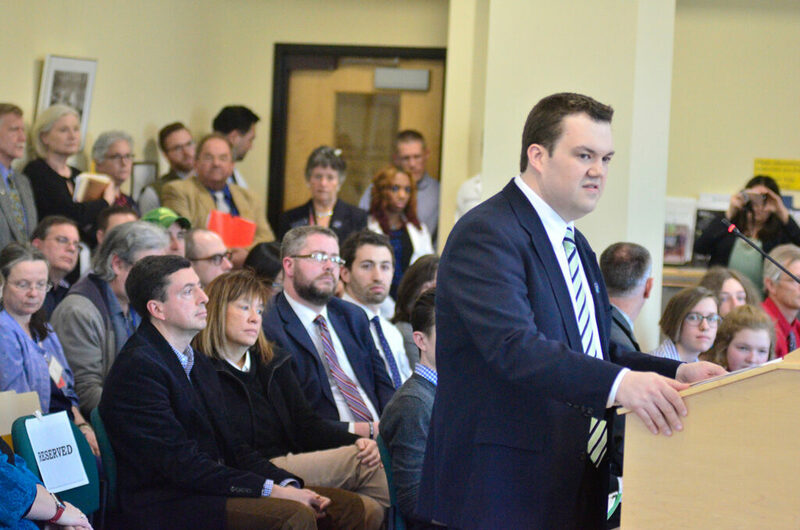 “What I would like the committee to consider, is to deem (this bill) “Ought Not to Pass” and not to legislate and mandate medical choices, injection of biologic agents and other medical procedures,” Meehan said. Injuries caused by vaccines do occur, but they are exceptionally rare, according to scientific research, and are far more unlikely than permanent medical conditions or death caused by infectious diseases. Claire Holman, a ninth-grader from Maranacook Community High School, testified that vaccines benefit society and protect students. “We need to be willing to take a miniscule risk and get vaccinated for the benefit of ourselves and others,” Holman said. A separate bill, introduced by Sen. Russell Black, R-Wilton, would mandate that the state could not review medical exemptions secured by parents for their children that would exclude their children from vaccinations. Rep. Heidi Sampson, R-Alfred, testified that many parents are already living with a vaccine-injured child, and that Black’s bill protects autonomy of decisions by medical providers and patients. “Without this bill, patients will be asked to play Russian roulette; the weapon, a vaccine,” Sampson said. Tipping said he would like to see the Maine Department of Health and Human Services devise rules for medical exemptions before taking a position on Black’s bill.